For the best results possible, we have our in-house lab design a “wax up” for you to preview. This model shows the characteristics such as size, shape and colour of the veneers being proposed. That way you know what your results will look like, before you ever start treatment. Getting dental veneers usually takes a couple of appointments across the span of about two weeks. After your teeth have been prepped and your wax up model approved, we’ll start to create your permanent veneers. You’ll wear temporary veneers in the meantime, to limit any sensitivity. Once the porcelain restorations are ready, we’ll bond them permanently to the front of your teeth. Be careful not to use your veneers to open packages or bite into anything hard, like ice. Although they’re strong, the porcelain can still chip if you don’t look out for them. If you tend to grind or clench your teeth, consider getting a protective bite splint to sleep in at night. Veneers are stain resistant, but they can still collect surface discolorations from things like tea or coffee. Care for your new smile the way you would your natural teeth, brushing and flossing regularly and scheduling a checkup every six months. Find out what veneers can do for you. 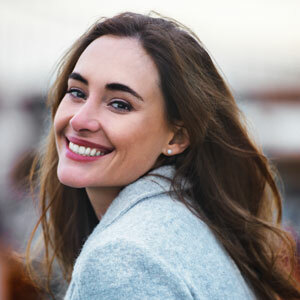 Schedule a smile makeover consultation today to explore which options are available.